The moment of software-as-a-service (SaaS) is undoubtedly upon us. The benefits the SaaS approach to software deployment are numerous and compelling, especially for small to mid sized organizations. The ability to have access to powerful technologies, with a minimal financial commitment has opened new vistas of productivity and competition to SMBs. But in spite of its much lauded wonders, the SaaS route is not without its perils. More used to decades old on premise software, most SMBs have little or no experience handling SaaS solutions. The rules for old on premise software analysis and purchase certainly don’t apply, as the vendor-customer relationship for SaaS is fundamentally different. In the case of on premise software, the vendor closes the sale, and makes a quick exit. But the SaaS relationship only begins with the sale. The customer entrusts the vendor with sensitive business data and is dependent on the vendor on an ongoing basis for the smooth running of systems, innovation, support and training. This dictates that new rigorous criteria be applied while assessing different SaaS solutions for our business problems. That is where the current white paper comes in. This white paper is a result of the authors’ extensive experience in the “SaaS for SMBs” arena, and lays down a comprehensive set of criteria that any SMB must consider while analyzing any SaaS solution. View the recorded version of the webinar. Software as a service presents a compelling new opportunity for small and medium-sized organizations. According to an early 2008 report by Forrester, software-as-a-service adoption by SMBs stood at 15% in 2007, up 58% from 2006. A 2008 report by AMI Partners titled “2008 U.S. Small and Medium Business Applications & Solutions Market Overview” found that 21 percent of small businesses and 31 percent of mid-sized businesses have tried SaaS products. SaaS usage will penetrate 86% of SMBs this year projects a March 2009 Microsoft study. SaaS adoption has been steadily growing over the years, but both in spite of and because of the economy 2009 promises to be the inflection point of wide-scale SaaS adoption. Those SMBs which were unaware, or semi-aware of SaaS can no longer ignore the strong value proposition of access to previously inaccessible productivity tools; the ability to collaborate with teams, partners and customers; shifting focus from IT to business, and improving speed to market through instantly set up solutions. The software-as-a-service approach brings very compelling benefits to SMBs, which is why it resonates so well with this segment. Under the SaaS approach, the software solution resides at the vendor’s remote servers, rather than the customer’s own servers, and is accessed via an internet connection as a “service”. Software configuration, upgrades, maintenance, and support are all responsibilities of the vendor; customers adopt a “pay-as-you-go” pricing structure, with month fees based upon actual use. Since they’re now “renting” the software rather than “buying” it, SMBs have access to otherwise prohibitively expensive enterprise class technologies. Though the SaaS approach is gradually making inroads in all application areas, it is ideally suited for some particular areas. It is not suited for applications which are highly specialized like sensitive financial applications, or those which involve huge data transfers, like business intelligence. SMBs however do not need applications which are so highly specialized, but applications which help improve productivity, and efficient management of information within and without the organization. SaaS is therefore, ideally suited for the kind of applications SMBs need, and they also allow the amount of customization needed in these scenarios. CRM and HR Applications – CRM and HR applications are the areas in which SaaS initially gained ground, and it is expected that this trend shall continue. Vendors like Salesforce.com helped popularize SaaS because of the sheer benefits they provided over on premise software, and their widespread success over the years. HR applications are suitable for the SaaS approach because of the social nature of SaaS applications. Freshbook is a company which has seen massive adoption in the SaaS HR application domain. Collaboration – As it been in evidence in recent times, online collaboration is perhaps the leading area in which SaaS applications can make a mark. The biggest names in technology have recently stepped into the SaaS online collaboration arena. With new realities like telecommuting, greater workforce mobility, business partners spread across the globe, and greater customer service demands, the need for business collaboration has never been greater. SaaS collaboration is ideally suited for these needs as it allows role based access and collaboration on information with the only need being a net connection. HyperOffice was an early entrant in the SaaS online collaboration arena, and its success in the SMB segment has helped popularize the concept of online collaboration. Email – Business email is essential for every organization irrespective of size. But email management is hassle ridden as it requires the company to set up and email server and hire staff to maintain it, and also manage archiving, virus and spam protection, and data backup. Setting up an email system requires a large capital investment, with an on premise solution like MS Exchange typically costing thousands of dollars. SaaS based email services allow customers all the benefits of an on premise system, without any large upfront investment, and simply being able to set up and manage business mail through a net connection. Moreover, good SaaS solutions also integrate with massively popular desktop email clients like MS Outlook, allowing users the best of both worlds. Online Backup – With the effort that goes into setting up data backup infrastructure and disaster management, SaaS backup offer a simple and effective alternative. Online backup solutions are especially popular with the small and medium sized business segment. In previous years, SaaS adoption in SMBs has been impeded more by perceptions than anything else. Decision makers question the wisdom of placing their critical business data and applications on third party vendor servers – deployed over the public network of the Internet. A 2008 Q4 study conducted by Forrester found the main reasons that hold back customers from opting for SaaS software. Most of these concerns are very valid, and should be allayed before a customer signs up for a SaaS application. But they are by no means universally applicable, as the SaaS model has itself been proved to be robust enough to handle business applications. According to a 2007 Gartner study, 45% of U.S. SMBs said they wouldn’t trust their data to SaaS vendors. What a difference two years makes. A Q4 Research by Gartner shows that those who adopted SaaS solutions were certainly not disappointed, as 90% were happy with their SaaS deployments. The tide has certainly changed over the years. Customer experience with pioneering SaaS companies like Salesforce, NetSuite and HyperOffice has demonstrated the benefits of the SaaS approach and changed market perceptions. The following is a comprehensive check list of things to look out for while evaluating a SaaS solution. One of the main benefits of a SaaS solution is that you can give it a fair trial with minimal commitment, since you can simply plug and play using an internet connection, which is not the case with on-premise software, where you have to depend on “product demonstrations”. Look for a free trial. Anyone with a good SaaS solution would give you a month’s free trial or more. That is because they’re not looking to make a quick sale and get away, or even retain you for a short while. The SaaS vendor benefits if they get recurring revenue from you over a long period of time, which is only possible if they have a viable solution. Find out where the solution is hosted. Is it in- house at the SaaS provider’s premises, or at a third party hosting specialist? Find out the credentials of the third party host. What is the server configuration? Find what quality certifications they have passed (like the SAS 70 Type II audit – an industry standard). Encrypted data. 128-bit encryption is an industry standard. Physical security measures like facilities, surveillance, guards, fire fighting preparedness etc. Password protection and permissions should be easy to administer. The system should allow delegation of administrative responsibility. For example a manager delegating permissions assigning rights to a team leader to manage level to permissions to each team member. The system should capture event logs of who logged in when, what information they accessed and what changes they made. SaaS solutions have to operate in the context of corporate desktop applications which have massive adoption (MS Outlook, MS Office etc). Workers have grown into these applications over years, (it is often said employees “live in their Outlook client”) and are looking to leverage them as far as possible. Your SaaS applications should ideally integrate with and leverage these applications. Although SaaS solutions don’t allow the kind of heavy duty customization required in financial organizations, good solutions allow you to greatly tailor the solution according to audience and business needs. Moreover, as with the functionality of SaaS solutions, it is point-and-click customization that can be handled by non IT employees. This allows content owners, and on the ground job owners to mould the solution according to real business requirements. One of the touted benefits of SaaS applications is that they’re fully functional in the diverse technology environments that might exist for your vendors, customers or traveling employees. Your traveling employee might have Microsoft Vista installed on his laptop, and a FireFox browser. You might want to collaborate on a document with a customer using Macs in their office. You want a SaaS application which is fully functional across operating systems and on all major Web browsers, through which SaaS applications are actually accessed. The application should work in all the environments below. The newest generation of mobile devices have incredible computing ability, and are extremely Internet friendly. With their massive popularity companies and employees are increasingly looking at these devices as corporate tools. The internet-ability of these devices makes them suitable to access SaaS solutions, which are also web native. Mobile access gives you an added level of flexibility. All good SaaS vendors have this feature. You should look for one that does too. Mirror servers make sure that, that in case your primary server crashes for some reason, your data is still secure and backed up live. Make sure that the servers on which your data resides have mirror servers. This ensures that you aren’t left high and dry in case of an emergency, and can continue work with minimum disruption. As discussed before, one of the main benefits of SaaS is that you have an ongoing access to innovation and new features, as opposed to the sporadic method of “new versions” for on premise software. Make sure that your SaaS vendor regularly upgrades the product, and you have free access to these upgrades. Find out when the product was last upgraded, and how often it is upgraded. When there’s a boom, everyone jumps on the bandwagon, and when it goes, companies fall like a pack of cards. SaaS is undoubtedly the new frontier of IT startup wannabeism. You need to be looking at companies with staying power, not fair weather startups. Tenure means the company has robust enough solutions for customers to keep coming back month after month, year after year. Moreover there are other benefits like tools built from the bottom up, experience with real life business problems and tools which reflect that, a service ethic built over years etc. As with all service contracts, the relationship with a SaaS vendor is ongoing and much more than merely the technological tools. You need a vendor who is fully engaged and involved throughout the life cycle of your relationship – from helping you define your business problems, to training, to implementation, to dealing with problems and so on. Training – Do they offer training? Is it free or paid? What are the costs? Self Support – Do they have extensive help documentation? Do they have an automated self help engine that helps you easily resolve your queries? Since SaaS solutions evolve very quickly, has the help documentation kept up to date with latest changes and bugs? Customer Support – Do they offer live support? What are the mediums? How prompt is the response time? Do they have chat support? Do they have a working live support number on their site? Do they have a support ticketing system? What is the time horizon for the resolution of support tickets? Is the support paid or free? Business Consulting – Is it free or paid? Who does the business consulting? Is it a third party (as with Microsoft)? Is it provided in house by the vendor? What are their credentials for providing business consulting? The SLA (service level agreement) clearly lays out the commitments and obligations of both the vendor and customer. Since the software industry is more adept at software product transactions, the SLAs for SaaS solutions are not yet standardized. The vendor should have clearly laid out SLAs, which you should thoroughly study before signing up. The total number of paying customers a SaaS vendor has is a very sound indicator of the quality of the SaaS solution and service. If customers have paid for their software services on an ongoing basis, month after month, year after year, they must be doing something right. Also make sure they allow you access to their current customers for referencing. Don’t get fooled by the inflated numbers quoted by providers of free services. Especially in this uncertain environment, where companies cannot predict their growth (or shrinkage) in the future, the flexibility to scale makes special sense. You should have the flexibility to scale the solution up and down in tune with business growth and downsizing. Think far ahead, and consider how well the solution supports, say, 500 seats, or 1000 seats. 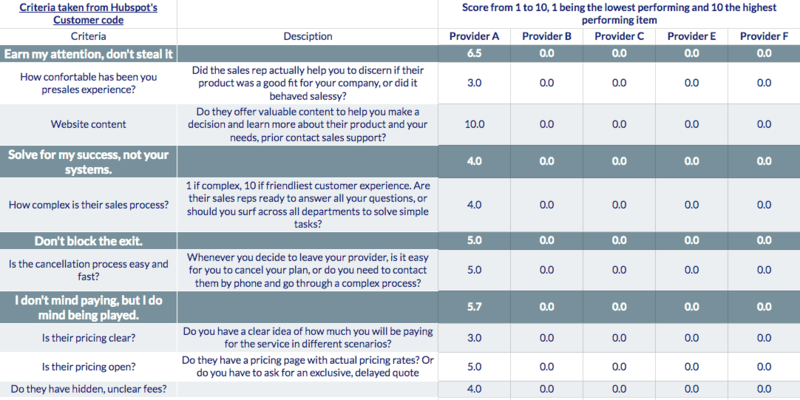 The above criteria equip you to thoroughly analyze any SaaS vendor. Given that the business relationship with a vendor is different in case of a SaaS subscription, the rules of the software purchase process are worth examining closely. Be sure that the vendor will be able to support your business needs day after day, month after month. The relative importance of each of these criteria might differ according to your business context or purpose. Mobile access might not be important to companies looking to access the solution only inside the company premises. Enhanced levels of security might not be important to a company in case the nature of data exchanged is not considered to be critical or sensitive. Since the relationship with a SaaS vendor is an ongoing one, rather than a one-time purchase transaction, your SaaS vendor should be periodically weighed on the aforementioned criteria. based on your wants and requirements. Making an uninformed decision can be costly. Evaluate your options. Find the perfect SaaS solution for your business. Rusty is an award–winning journalist and researcher with two decades of business technology experience. He is a frequent public speaker on career and technology topics, and writes for various publications, including his blogs at myglobalcareer.com, a site founded by him for global workers, and fastcompany.com, a hugely popular business site. Rusty was Editor in Chief of Global Services, a media brand focused on business and technology services, and served eight years at the helm of InformationWeek Research where he conducted domestic and global studies.